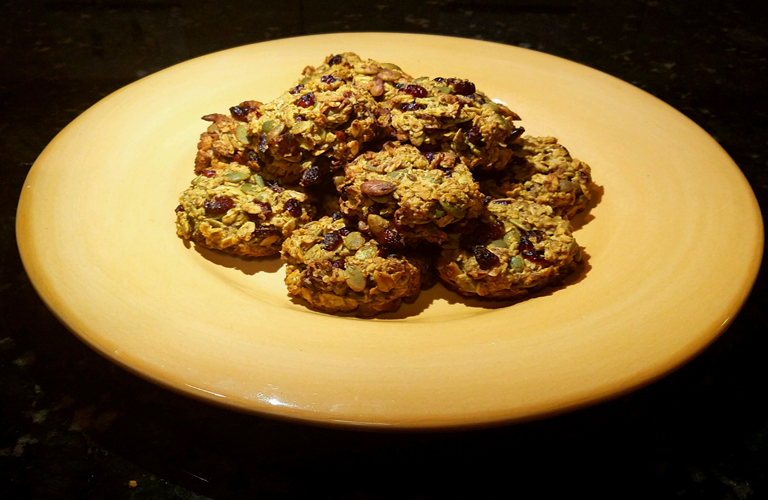 * This recipe contains gluten free oats, however, some people are unable to tolerate oats even if they are gluten free. Please use your own judgement. These pumpkin cookies are a great way to hold you over when you hit that 3pm slump, or any time you need to boost your energy between meals. With hearty wholegrain oats, cranberries and pumpkin seeds they’re not only delicious, they’re healthy too! In a small bowl warm coconut oil and honey (I prefer inside preheating oven, or on the stove top instead of microwaving). In a large bowl combine ALL oats, cranberries, pumpkin seeds, ground flax, pumpkin pie spice and salt. Add pumpkin puree, eggs (or flax eggs) and warmed coconut oil and honey. Fold ingredients until fully combined. Drop about ¼ cup of the mixture onto a cookie sheet and flatten (cookies won’t spread). Bake for approximately 15-20 minutes until edges are lightly browned, or if you prefer chewy cookies, 12-15min. Keep an eye on your oven, some run hotter than others! Let cookies cool on baking sheet, and enjoy anytime!